Deepa Christina Radh is the Content Marketing Manager at QuickTapSurvey, an offline data capture app for events and activations. So, you made it through the big industry trade show. Those events can be utterly exhausting, and you may not have accomplished everything you wanted to, but you made a ton of great connections. What is your next step? It is time to follow up on those links and make your magic happen. What you must do is write a follow-up email. We’ve put together some simple tips to help you write the perfect email to cast your business in the best light possible. Don’t give your connections time to forget who you are or to meet their needs with another provider. As the old saying goes: “strike while the iron is hot.” Acting quickly is an easy way to make sure that your email makes a big impact. Get to know your leads and customize the email. You are more likely to make a good impression with your email if you personalize it. Can you send it directly to the decision maker or address the pain points of the organization? If so, you are on your way to making a positive impact. Chances are, many companies will be contacting your new connection after the trade show. A single email may get lost in the shuffle. A drip campaign or a lead nurturing campaign may be better suited to this job and allow you to build a relationship with the potential customer. If you want to make sure your email messages are read and not just tossed into the digital trash bin, crafting a good subject line is key. There are many things you can do that will increase your readability. Check out some of the great information published on the topic by Hubspot, for starters. In the meantime, think about utilizing the client’s name in the subject line as a good way to make the initial connection. Instead of sending an email that reads like an advertisement for your company, send an email that focuses on actions that a company can take that benefits that firm. If those actions happen to involve your company, great! However, you want to make sure the message is phrased in such a way that it appears to be advice—not advertising. Instead of a boring black and white email, think about adding photos, video, and other media elements. Even better, if you can add imagery that reminds the client of the connections made at the trade show, you will put yourself in an even better position—because you will be remembered and can build on that existing relationship. It is important to bear in mind that after a major trade show that many prospects will be overwhelmed with correspondence. The large amount of mail generated after an event means that you must do something to differentiate yourself from the others. If you can do that, you will be more likely to earn a positive return on your trade show marketing investment. One of the best ways to differentiate yourself is to take your customer’s opinions into mind. If you use a trade show lead capture app, you have the opportunity to collect more than just an email address. 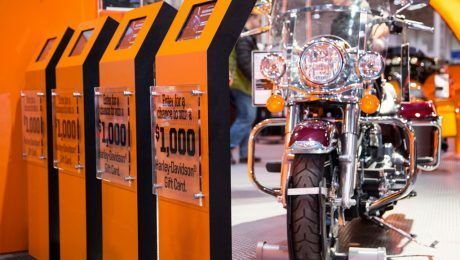 A trade show is an opportunity to boost your brand awareness, capture leads, and even launch a new product to a receptive and targeted audience. The goals you set before the show will help you streamline your efforts and maximize your ROI on the money you spend to get there and exhibit. You’ll also be able to measure the success of the show in a tangible way. Can you capture leads for your salespeople to follow up on later? Can you make appointments with people you’d otherwise have to travel to see? Can you get your brand in front of a wider audience or gather free publicity? Is there any market research you can gather while you are there? Can you give a new product a head start with a VIP launch or preview at the event? A fast and easy way to generate buzz about your latest product is to offer a special, VIP sneak preview at your next show. 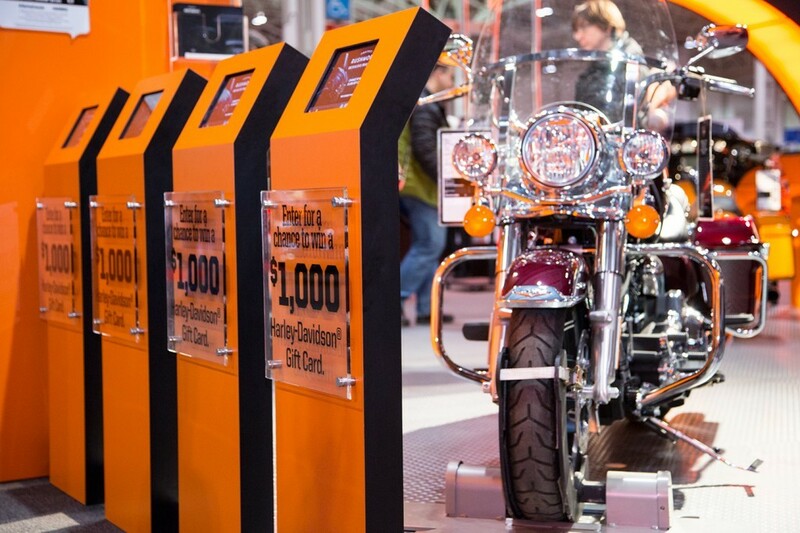 You can do demos, tailor your booth around the new item and even do an in-person trade show survey to get feedback that can help you market your latest product effectively. How many people in your industry and related areas are aware of your brand? Your trade show experience offers a valuable opportunity to introduce or reintroduce your brand to your audience. Offer demonstrations, educate visitors about your product and get your items into people’s hands. A trade show appearance can help legitimize a new business or revitalize an existing one, making your prospect more aware of your brand. What do your customers really think about your product, what are they most worried about in general and what needs do they have. 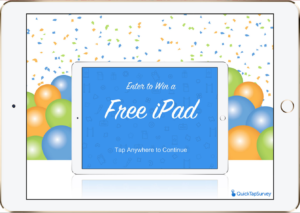 A steady stream of visitors to your booth is a valuable opportunity for data collection via a lead capture app for trade shows; offer a prize and you’ll be able to capture leads and data with ease. Local, industry and national media may be at your event; this is a valuable opportunity to make connections that will help your business grow. Make sure you have and take along media relations kits to pass out to press and that you make your mark on the visiting journalists. You could also gain valuable press coverage, just by attending and being featured on television or in news media. Boost your existing channel relationships and forge new connections at industry shows. From your existing partners to new agents, distributors and dealers, a trade show is a valuable opportunity to connect. It is likely your primary goal; capturing leads that your sales team can follow up on later. Incentivize lead capture and you’ll bring home plenty of data for your sales team to work with. Use a tradeshow lead capture app to collect data and make it easy for your team to make connections after the show has ended. Work with your existing customers and forge new relationships by meeting in person at the show. You’ll be able to see more clients in the few days you’re all in the same city that you could any other time of year – without the travel costs. Your own specific goals and objectives will vary, but using the general outline above to make sure you cover everything from lead generation to brand awareness and even media relations ensures you make the most out of your show investment. Planning to attend a trade show can be overwhelming; having a clearly defined set of goals and a timeline can help you spread things out and ensure you have a successful show. From the initial strategizing and planning to the actual day of the event, here’s how to prepare for a successful show. Which shows will you attend this year, and what are your goals? How much will it cost to attend and which shows are most likely to help you meet your goals? This is also the time to think about your booth and determine if any changes or additions are needed to suit the space you have in mind. Review last year’s trade show survey results, look at your prospect data and fine tune your strategy for the year to come. Start planning for the show by choosing your primary goals, deciding what products or services you’re most interested in showcasing and beginning your marketing strategy. Start building buzz now and your target prospects will be ready to stop by on the big day. This is also the time to book a block of rooms at your hotel (even if you don’t know which specific staffers will be there) and to order promotional items with your business name and information. Gather information from the host to determine where your booth will be, how the show will be marketed and what materials they’ll need from you. If there is an official show or industry hashtag, now is the time to start using it. Choose the staff who will be attending, clear schedules and make any travel arrangements you need to for the event. Work on your technology – what will you use to capture leads, to display presentations or simply entertain guests? 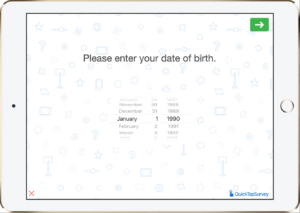 Select a lead capture app for trade shows now and make sure everyone knows how to use it. You can also use this time to finalize your marketing materials and to make decisions on your promotional materials and choose a cohesive look for your booth staff. Finalize everything, from your booth shipment to your branded materials and promotions. Meet with your show team to discuss the show and your goals and to hand out roles for the big day. Everyone should understand the goal of the show and their particular tasks – this is important if you are bringing along first timers or those who are not salespeople. Talk about lead generation and why making connections is important and make cheat sheets for anyone who needs them. This is also an ideal time to practice skills needed for the show and run through some sample conversational openings and demos with your team. You’ve laid in a lot of groundwork and the big day is here. Get the most from your show experience by getting out there and making connections. Greet visitors, capture leads and pass out promotional products; you’ll benefit from these connections for months to come. This is also an ideal time to make in person connections and sales visits you might otherwise have to travel to make. One of the most important things you can do – and one of the most often missed – is to follow up with your prospects after the show. Organize the leads generated by your tradeshow lead capture app and distribute them to your sales team, answer any questions that arose and analyze your results to determine if this specific show is worth doing again next year. This is also the time to determine what worked well for your booth and the overall experience and what you might want to change next time. Following up with connections you made via social media and email can also help you solidify your relationship and ensure your brand is remembered long after the show has concluded. Although every event is different for every brand in terms of goals and opportunities, on-site data capture is that one constant, vital metric all marketers need in order to gain insights and justify event spend. Since everything, yes everything, can use a bit of improvement, here are some insider tips to legitimately improve your data capture strategy and workflow in 2015. Not all platforms are created equal. It’s up to you to determine which one is right for you. Although it is 2015, paper is still largely used to collect data. For obvious reasons, this should be your absolute last resort. You could develop a custom solution, but that will devour your budget. To get the best bang for your buck, choose a mobile app. We’re not going to tell you what information you should collect, because this decision is purely based on the goal of the event, as well as pre-defined measurement programs. The one thing we do keep reiterating is this: choose quality of data over quantity. Your results are only as good as the questions you ask. 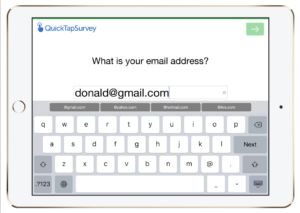 The more lengthy and wordy your survey is, the greater the risk of abandonment. Brevity is key in research. The motto “Be Prepared” isn’t just for Scouts. Ensure that you have enough mobile devices as well as brand ambassadors to meet your data capture target metrics. If you’re expecting large crowds, think about setting up tablet kiosks in high visibility areas. When skinned and branded, these can look pretty enticing on the event floor. They are also shown to attract crowds when tied to an incentive. Unique venues like public squares and office buildings are shown to increase engagement levels, especially when the user experience is smooth and fast. If your data capture requires connectivity, ensure that you have a reliable backup plan at hand, or better yet use a mobile solution that works offline. Choose a platform that takes the time and complexity out of data reporting, visualizations and trends analysis. After all, the real value in data capture is being able to act on market and information trends as they are happening. At your event, you’ll quickly want to know key data points such as how many people showed up, what they are saying and which brand ambassador is capturing the most data. We’re headed towards a future of networked connections, also known as The Internet of Everything. Choose platforms, devices and communications that connect with each other so that the duplication of effort is eliminated. 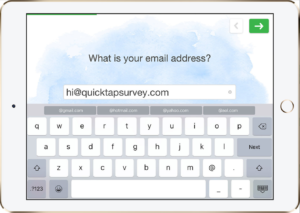 For instance, when you collect marketing opt-ins using QuickTapSurvey, they are fed straight to an email marketing platform like MailChimp.